Since the early 1920s, Paulist Fathers have been blessed to provide pastoral care for Catholics from the United States living in (and visiting) Rome, Italy. After some 90 years in residence at Rome’s Church of Santa Susanna, this vibrant community of faith now calls a new church building home. 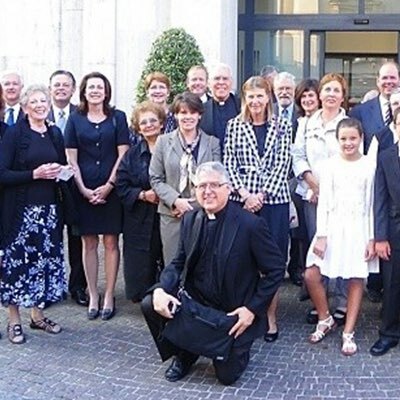 August 1, 2017, was the official start of the community’s residency at St. Patrick’s Church / San Patrizio a Villa Ludovisi. Officially, the ministry is a “Mission for the Care of Souls for U.S. Faithful residing in Rome.” Paulist Fr. Greg Apparcel is the official chaplain for the mission and rector of St. Patrick’s / San Patrizio. St. Patrick’s / San Patrizio is at Via Boncompagni, N. 31, near the corner of Via Boncompagni and Via Piemonte. It is close to the U.S. Embassy and the famous Via Veneto. A close metro stop is Barberini. If life takes you to the Eternal City, the Sunday Mass schedule at St. Patrick’s / San Patrizio includes a Saturday vigil Mass at 6 p.m. and Sunday Masses at 9 a.m. and 10:30 a.m.
Daily Masses are said there Monday to Friday at 6 p.m.
During the academic year, Paulist Fathers also say an English-language Mass on Sundays at 11 a.m. at the chapel of the Marymount International School in North Rome. Associate Pastor: Fr. Bernard Campbell, C.S.P.